Spider-Man is the most popular Marvel super hero. He has long been considered Marvel's flagship character and is even featured on their logo. 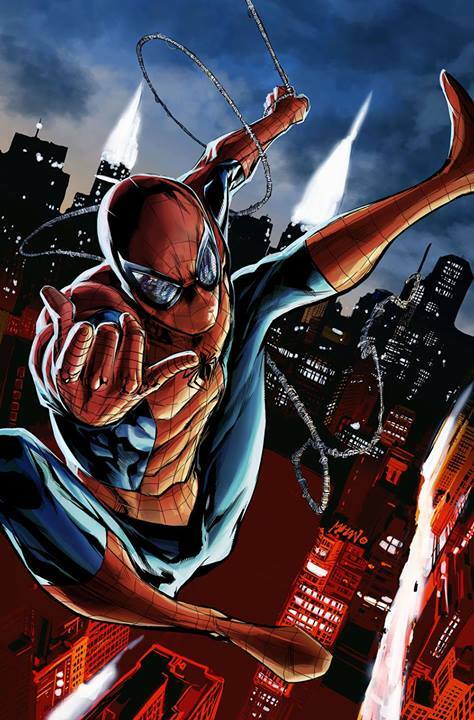 Peter Parker is an ordinary teenager when he is bit by a radioactive spider that leads him to developing super powers. Using his super powers to fight crime at night, Spider-Man must also juggle his real life responsibilities during the day. There have been three sets of Spider-Man films. In the first set of 3 films he was played by Tobey Maguire. In the 2nd set of films called the Amazing Spider-Man series, Spider-Man is played by Andrew Garfield. 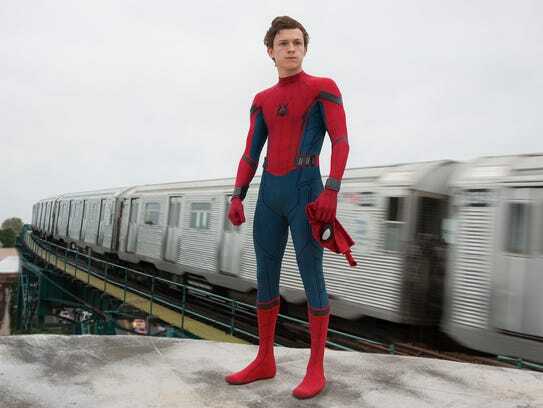 Tom Holland plays Spider-Man in the MCU films which will includes both joint films as well as solo movies. Spider-Man has appeared in Captain America: Civil War, Spider-Man: Homecoming, and Avengers Infinity War. Spider-Man will next appear in Spider-Man Far From Home and like Avengers 4. Spider-Man: Homecoming - News, Trailers, and MORE! Tom Holland is Spider-Man see his Parkour Moves! Pictures of Spider-Man kicking people in the face! Marvel released this quick teaser of a snip it of the upcoming Trailer for Spider-Man Homecoming. This is right Marvel is now teasing the teaser which is kind of amazing in and of itself. You know fans are going crazy for something when they want to see a preview of an upcoming preview. Quick highlights a familiar face from the beginning of the MCU. Tony Stark mention and oh yeah an awesome new Spider-Man suit. Peter Parker is your average American teenager. He is bookish, and likes photography. Initially, he is not shown as a complete nerd but more of an average, insecure teenager. At high school he is picked on by the popular jock, Flash Thompson. He lives in a modest home with his Uncle Ben and Aunt May. He is an orphan, with his parents having died in a car accident when he was younger. Visiting a science exhibit Peter is bit by a radioactive spider. The spider's bite gives Peter the super powers based on a spider. He can climb on walls, has super strength and speed, perfect balance, greatly enhanced agility, some heightened durability. He also has precognitive like ability called the spider sense that provides him with a warning of danger. The danger sense can at times tell Spider-Man the location of the threat, the type of threat, and the degree of the threat. Some of Spider-Man's villains like Venom do not trip the spider sense. The Spider-Sense also acts to increase his reflex time as he can feel where an attack is coming from and react appropriately. Initially, Peter creates the Spider-Man suit as a way to make money as an attraction. However, his destiny is quickly altered. Peter fails to stop a thief saying that it is not his problem. Later, his Uncle Ben is killed by a mugger. When Peter tracks down the mugger in his Spider-Man guise he learns that the mugger that killed his Uncle Ben was the same thief he let get away. This helps drive home what would become the golden rule of Spider-Man's ethos "With Great Power, Comes Great Responsibility". The phrase is later attached to have come from his Uncle Ben himself. Seeking to repent for his mistake, Peter uses his scientific skills to build a webbing material that could be fired from his wrists. He uses these webs to swing around the city to save and protect people. Spider-Man is almost immediately labeled as a villain and neer-do-well by the local Newpaper the Daily Bugle head honcho Jonah Jameson. While disagreeing with how his Spider-Man persona is being portrayed in the news by Jonah, the Bugle is one of the only places where Parker can find work. He takes pictures of himself in his Spider-Man guise and sells them to the paper as a freelance photographer. Ironically, this bizarre relationship of working for his enemy lasts from the 1960s through the 2000s. Can cling to walls and climb them like a spider. Using Webs - Can swing quickly great distances particularly when around very high structures like Skyscrapers. The webs can also be used as an offensive weapon that tie up villains, or blind them. They are generally non lethal as they dissolve over time. Additionally, Peter is a scientific genius who creates his own form of webbing. He also often uses a Spider Tracer a tracking device tuned into his Spider Sense ability. At different times he also created paralysis darts and web bombs. Spider-Man has a long list of friends, family love interests, and enemies. Spider-Man has large a highly developed rogues gallery considered one of the best in all of comics. Many Spider-Man villains have an animal based theme like the Vulture, Dr Octopus, Beetle, Rhino, and Puma. Depending on the time period his arch nemesis would be the Green Goblin, Kingpin, Venom, Carnage, Dr. Octopus, or Morlun. Meet all of the Spiders of the Spider-Verse! Spider-Man was ranked by IGN as the #3 greatest comic book hero of all time. He was behind DC's Superman and Batman. Personally, I think it could be argued he is the #1 character. While Superman was a top selling character for decades prior to the creation of Spider-Man, he has in many ways been eclipsed by the webslinger. Comic and Movie sales for the past 2 decades have heavily favored Spider-Man over Superman. That said Spider-Man currently seems to be on something of a decline. The fact that Spider-Man's film rights are owned by SONY has prevented him from having a connected film universe to the rest of the Marvel characters. As the Marvel Cinema Universe has done very, very well, he has been somewhat hamstrung by being at SONY. Batman arguably has the strongest film, and tv-animated shows over the past 2 decades of any character. The Dark Knight Trilogy is considered by critics to be among the best CBM trilogies of all time. That said the popularity of Spider-Man is likely bigger, especially on an international level. This popularity shows up in licensed product sales. Despite having softer movie numbers than expected Spider-Man is still crushing all other heroes when it comes to selling licensed products and this battle is not even close. The Hollywood Reporter did a study on licensing revenue from merchandise at Marvel and DC. The Hollywood reporter found that Marvel made $1.3 Billion off of Spider-Man related license sales. Marvel made $325 million off of Avengers sales. Spider-Man made nearly 4 times what the Avengers did. On the DC side Batman brought in $494 million and Superman $277 million. The Batman and Superman numbers are not bad, but obviously they are dwarfed by the huge Spider-Man numbers. Spider-Man has a few characteristics that make him unique. He was perhaps the first teenage superhero that was not a side kick or protege of an older hero. As a teenager of humble means he faced a variety of everyday problems like girls, popularity, family issues and perhaps most notably money. Unlike, other super heroes Spider-Man was faced with basic constant worries that normal people (especially young people) think about everyday. While most super heroes focused on the bad guy of the month, Spider-Man also focused on these every day dilemmas. You could almost describe Spider-Man as neurotic with his constant focus on his worries. Spider-Man was one of the hallmark characters that led to the Marvel way of storytelling. Marvel focused on broken and flawed Super Heroes, with more issues, personal drama, and real life problems. At the time this was something of an evolution in the way these stories were told. Tom Holland is set to appear as Spider-Man in the film Captain America: Civil War. This will introduce the character in the Marvel Cinematic Universe. Spider-Man first appearance is in Captain America Civil War. Uncle Ben will already be dead. He will have been active for around a year as a super hero. He said to be around 15 years old and he is in High School when he is recruited by Iron Man to help his super team battle Captain America. Spider-Man appears in his own film Spider-Man Homecoming where he emerges as his own hero out from Tony Stark and battles the Vulture. Spider-Man also helps fight the forces of Thanos in Avengers 3 Infinity War. He notably is one of the heroes to disapear when Thanos wipes out half of the life in the universe. Don't go anywhere there is more SPIDER-MAN! Who is Alpha on the Walking Dead? How to beat Jolteon in Pokemon Go? The Code-A-Pillar expansion packs which is best? The Man-Thing easter eggs have you caught them? Agents of SHIELD confirmed for Season 7! The Harry Potter Wizards Unite teaser is here! Who is Mister Hyde AKA Dr. Calvin Zabo? How to beat Rhydon in Pokemon Go? Who is the Fusia Girl in Guardians of the Galaxy? How did Thanos die in the comics? Why do Hawkeye and Mockingbird Divorce? Who is Baron Helmut Zemo?